In the first part of the article series we installed the Desktop Delivery Controller role, while in the second part we executed the initial setup of the first and following Desktop Delivery Controllers and the Citrix StoreFront basic configuration. In this third part we will continue with the installation of the VDA agent, followed by the creation of a basic XenDesktop environment. If you don't want to miss my future Citrix tutorials and best practices articles, sign up for updates here! 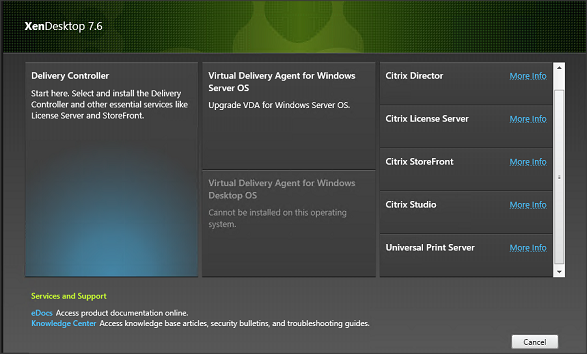 There are two VDA installations available: One installer for Windows Server OS and one installer for Windows Desktop OS. The installation wizard checks the OS and only shows the available VDA option. The Windows Server OS VDA is supported on Windows 2008R2 SP1, Windows 2012 and Windows 2012R2. The VDA Agent for Desktop OS can be installed on Windows 7 SP1, Windows 8 and Windows 8.1. In this article I will also show the installation steps for the Windows Desktop OS, but I will use the Window Server OS VDA for the purpose of this article (almost all license editions support the Server OS features). The set-ups are pretty similar, so it also does not make a big difference. I will mention which part is Desktop OS only. The first question in the installation wizard is about the way the VDA will be provisioned. 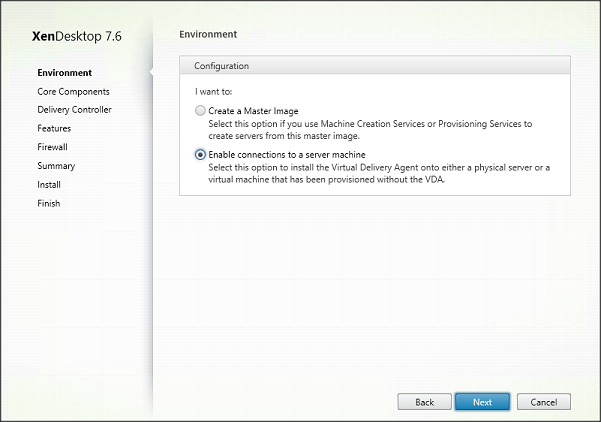 When using Citrix deployment techniques like MCS (Machine Creation Services) or PVS (Provisioning Services) you will install the VDA in the master image only and the Citrix should take care that the machine is unique. When you don’t have such a deployment you choose that the machine connects directly to a server machine itself. 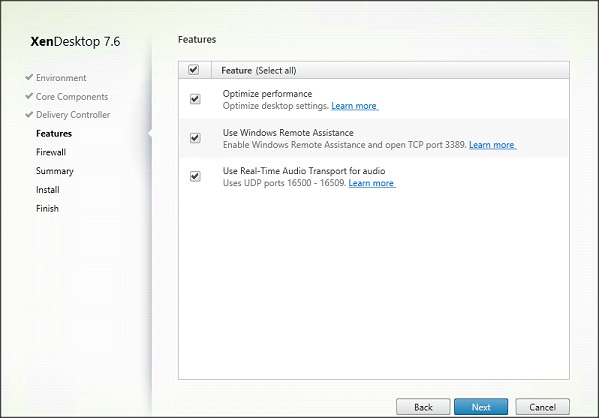 I don’t want to make this article series too complex, so I won’t use MCS or PVS so we only focus on XenDesktop 7.6. 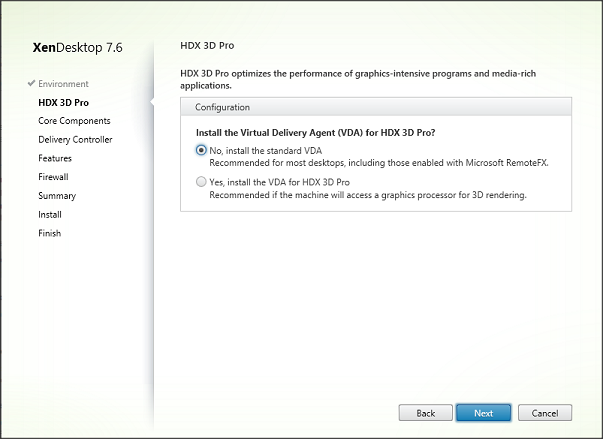 In the Desktop OS installation wizard one additional step is shown; do you want to use VDA for HDX 3D Pro. If you do want HDX 3DPro logically, you need to select this option, but also ensure that the required (hardware and software) components are in place. As already mentioned, I actually use the Server OS installation for this article so I don’t have to actually choose an option. The following step is again available in both installers, where you choose which core components need to be installed. 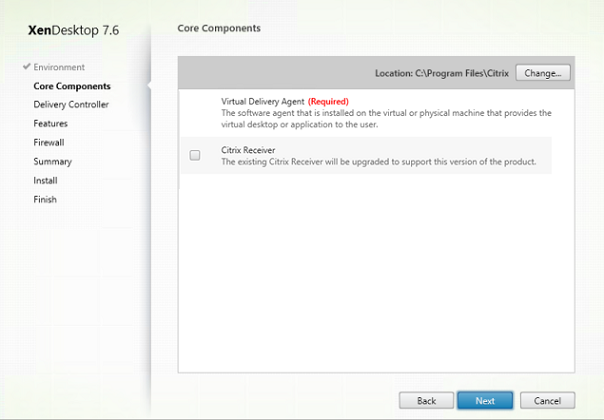 The Virtual Delivery Agent is logically required; you can choose if you would like to install the Citrix Receiver also. Be careful with this one as it installs a Receiver 4.x version (which does not support the PNAgent functionality anymore). Do not provide a delivery controller at this moment. You need to use one of the other possibilities after the installation of the VDA agent. Provide the Delivery Controllers during the wizard, actually now. This is the easiest method, but less flexible. When you provide the role Delivery Controller to other servers, you need to change the settings locally on each VDA agent. You can add a Service Connection Point (CSP) and a security group to Active Directory, so the VDA can get the Delivery Controller more dynamically. I would suggest using this option in large production environments. 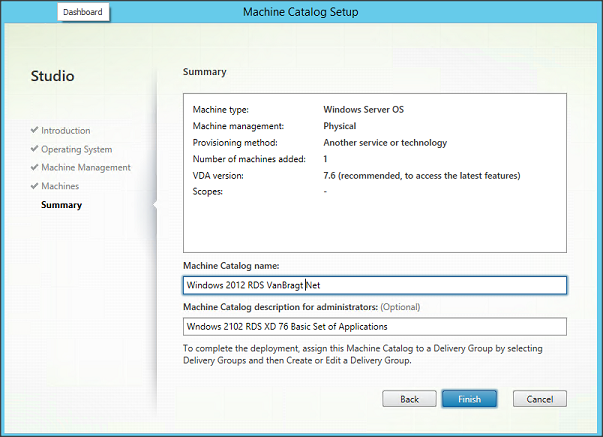 Machine Creation Services (MCS) can provide the Delivery Controller information, you can only use this option if you use MSC to deploy the VDA agents. The next step is providing which features should be installed/enabled. Really consider the option Optimize performance and read the corresponding knowledgebase article (http://support.citrix.com/article/CTX125874) in advance. It’s possible that the optimization conflicts with requirements in your organization, as it’s fully focused on the best performance not about offered visuals and/or functionalities. I would normally enable the other options by default. To communicate with the Delivery Controller to offer the Remote Assistance feature and to use Real Time Audio, several communication ports are required. 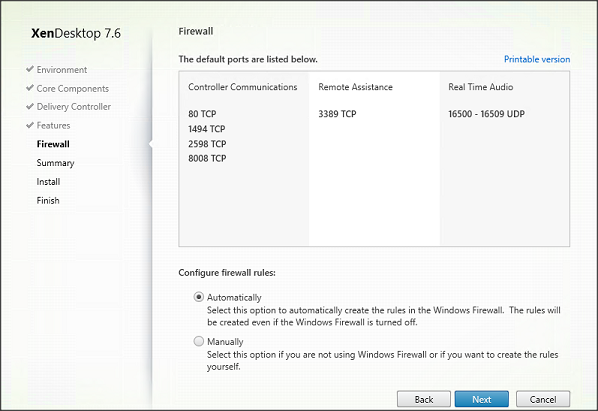 Just as with the Delivery Controller installation you can set those Firewall Exceptions manually or automatically during the installation process. A summary is shown with the installation settings provided including the destination location of the actual installation. 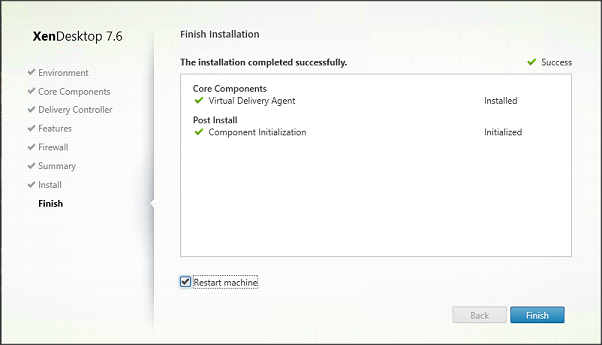 Just like the Delivery Controller wizard, a nice process window will be shown during the actual installation phase. When not using PVS or MSC technology you will install the VDA on more servers or desktops to create a pool of available machines. When the VDA’s are installed we can start configuring the XenDesktop environment. As shown earlier you can do that via the initial set-up, which creates the basic configuration. I have chosen to create it manually to provide a better insight of what needs to be configured. The first step is to create a Machine Catalog. You should see a Machine Catalog as a group of VDA which will be pulled out this Catalog during further configurations. 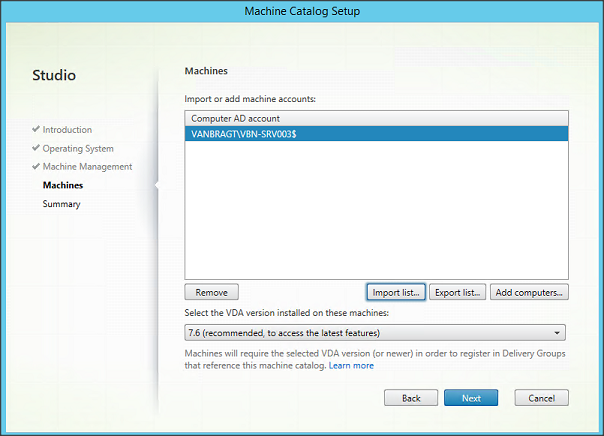 During this further configuration those machines will be picked automatically (you cannot select which VDA you would like to use), therefore it’s a best practice to create a Machine Catalog which holds VDAs offering the same configuration. 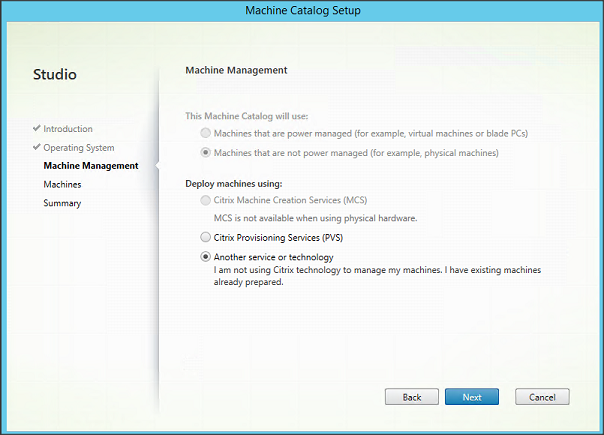 Creating a Machine Catalog is done through the Studio Console, where both the Actions menu in the right pane, as well as the rightmouse menu can be used to start this task. The first screen of the Machine Catalog Setup describes pretty well what you should have done before starting this wizard. However if you have done this before you probably don’t want to see this information anymore, happily you have the option available not to show this screen anymore. 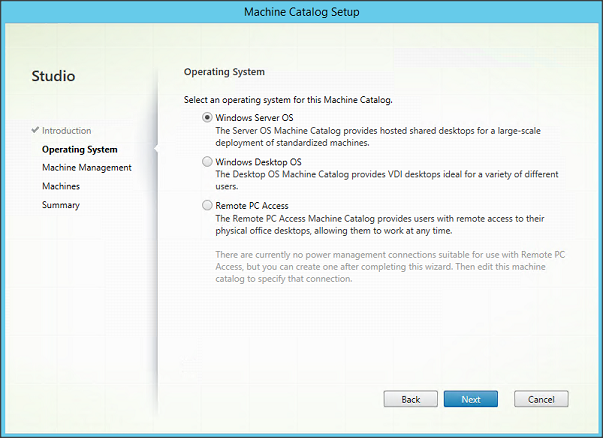 Secondly you need to choose if the Machine Catalog exists of Server OS VDAs of Desktop OS VDAs. It’s not possible to mix and match those types of OS together in one Machine Catalog. As I installed the VDA on a Server OS I will check Windows Server OS. After selecting the Operating System you need to provide information about machine management. 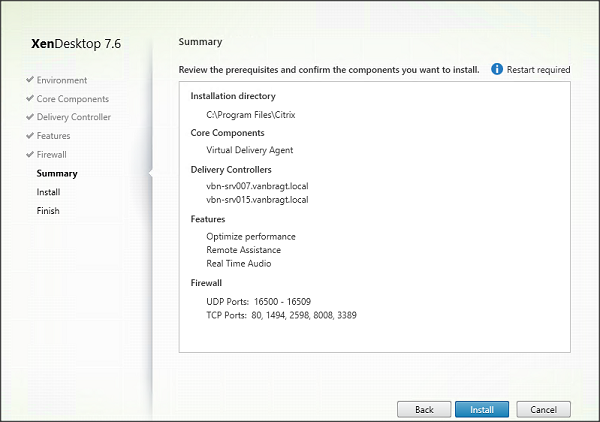 As seen in the VDA agent XenDesktop 7.6 can be combined with Citrix technologies MCS and PVS and XenDesktop should know which technique (if any) you are using. When you select one of these technologies you can also choose to use Power Management. As in this article I don’t use MCS or PVS, I need to select another service or technology. Next step is to add the VDAs in this Machine Catalog. This screen really depends on the Machine Management option you are using. For example: within a PVS machine management you will see your PVS infrastructure Device Collections and you need to pick a device collection. Because I’m not using any machine management technique I have to select the machines based on Active Directory. Also you need to provide the version of the VDAs. Preferable you will use the VDA 7.6 version, but you can also use VDA that still have the older VDA running (in an upgrade scenario). Although the last screen is called Summary you still need to provide information. 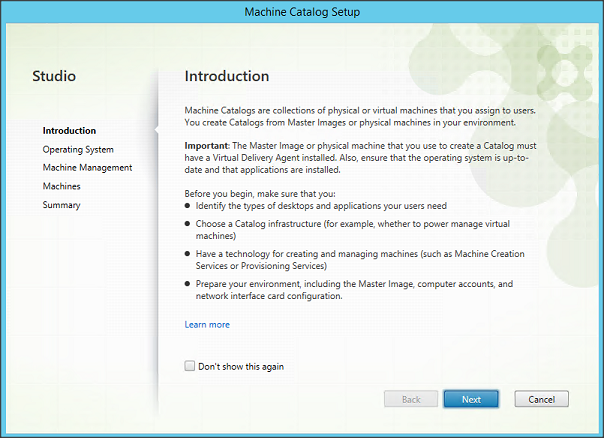 The first part indeed shows a summary of the earlier configured settings, however you also need to provide a Machine Catalog Name and an optional description for recognition of the Machine Catalog. The summary page also mentions that a next step is required to complete the deployment by assigning this Machine Catalog to a Delivery Groups. That’s exactly the next step we are going to execute in the next part of this article series. In this third part we started with installing the VDA component. The machines running this VDA component are the actual machines the user will execute their (daily) tasks on. After the VDA installation part, we started with the basic configuration of a XenDesktop site by configuring a Machine Catalog.